The objective of this induction heating application is to heat a steel boiler tube assembly so as to fuse a nickel-based, hard-surfacing alloy which has been applied as a spray. The tube is coated with the alloy to provide corrosion resistance during use; wear-resistant nickel alloys are applied to new parts where wear or corrosion is anticipated, or to worn parts to replace metal lost through wear or corrosion. Wall Colmonoy Corporation has developed many nickel alloys for hard-surfacing with a variety of different resistance characteristics for wear, impact, abrasion, corrosion and galling. A specially-designed pancake-style inductor was used to provide optimal heating efficiency and a scanning system was employed to move the inductor over the length of the boiler tube. Initial tests were conducted to establish a heating profile and determine time-to-temperature. RF power was applied while the scanning system moved the coil across the boiler tube at a rate of 1 foot per minute. An even heating pattern was observed throughout the heated area. 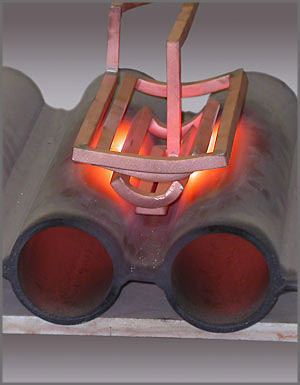 Successful, even heating was achieved by moving the inductor across the tube at 1850°F, at an RF frequency of 100kHz .The Colmonoy alloy was evenly fused to the boiler tube surface, increasing the corrosion resistance of the tube. The nickel-based alloy has been applied as a spray.